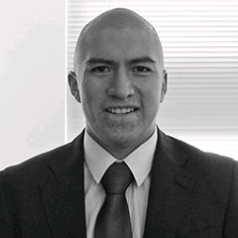 Aarón Estrada is an Attorney at Law graduated from the Instituto Tecnológico Autónomo de México (ITAM) and obtained a diploma in Intellectual Property Law from the same school. Working in Intellectual Property firms gave Aaron experience in several areas of Intellectual Property such as litigation involving patents, trademarks and industrial designs, trademark prosecution and copyright protection. Aaron also counsels foreign law firms and foreign and local companies regarding Intellectual Property practice in Mexico. Besides his law practice, since 2016, Aaron is serving as an Intellectual Property advisor for an entrepreneurship bootcamp in Mexico. Litigation and enforcement of Intellectual Property rights, comprising cancellation actions, infringement actions, domain name disputes. This practice includes procedures in the Mexican Patent and Trademark Office, the Intellectual Property Chamber of the Federal Court of Tax and Administrative Affairs and Federal Circuit Courts. Filing of any case of Intellectual Property, such as Patents, Trademarks, Designs and Copyrights. Reporting to clients status of cases. Trademark search and trademark renewals. Monitoring and managing Madrid Protocol registrations and opposition procedures. Assignments, changes of name of applicants and registrants. Drafting and submission of legal arguments to overcome objections during formal and substantive examination of trademarks. Copyright protection of art works and computer programs. Protection of artist names, fictional characters and publications.